The Go Go: Wong Choice, Ray of Light, Glamour Perl + More – UPDATE! PLEASE NOTE: Cabaret Versatile‘s show tonight, Friday, February 28 at First & Hope has been rescheduled to March 28th because of a luggage snafu that sent costumes to Guatemala! Go Go’ers, this week is looking particularly femme-tastic. Mix and match any of the above. Plus, a chance to get gorgeous. Question: When do you get to see a mad-smart talent mid-creation? Answer: Tonight, if you attend Kristina Wong‘s Notes-in-Process: The Wong Street Journal. Presented by Writ Large Press | DTLAB, the multi-talented and socially conscious Wong uses humor and smarts to explore her recent trip to Gulu, Uganda, with the Women’s Global Empowerment Fund where she conducted field research, made a rap album, and became a hip hop legend! And Ms. Go Go thought she was a creative multi-tasker. In addition to seeing an early, in-progress version of a solo show premiering in 2015, attendees will get a copy of Wong’s rap album Mzungu Price with all door proceeds going to the creation of Nerio Badman’s music studio in Gulu, Uganda. And since it’s at the iconic Grand Star Jazz Club in Chinatown, you can nosh on nom from the relocated Starry Kitchen. Kristina Wong, tofu balls, a rap album and music studio funding? Go Go’ers, that’s what we call a “superfecta”…. NOTES-IN-PROGRESS: THE WONG STREET JOURNAL — Wed, Feb 26 @ 8pm. $5 – $100! (gets you a copy of Mzungu Price) — Grand Star Jazz Club, 943 N Broadway, Chinatown/DTLA 90012. More info HERE. The original Ms. Go Go…. You’ve seen them on Mad Men. You’ve coveted them. If you’re lucky, you’ve sat in an original. 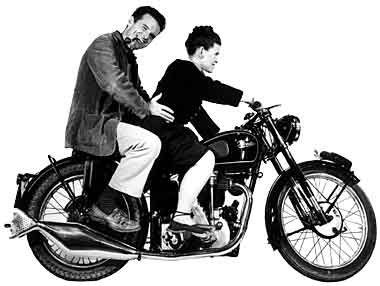 Now the distaff co-designer of the legendary Eames oeuvre gets her own show in Ray Eames: In the Spotlight at the Art Center College of Design in Pasadena. The First Lady of contemporary design is not only a co-creator, with spouse Charles, of mid-century Modernism’s most noteworthy furniture but an abstract expressionist painter, textile artist, and creator of covet-worthy magazine covers for Arts & Architecture. Her textiles, including Sea Things, was produced by Schiffer Prints, which also produced textiles by Salvador Dali and Frank Lloyd Wright and she also worked with three-time Academy Award-winning Dorothy Jeakins to design her signature dirndl. At the opening reception on Friday, you’ll get to play with giant versions of the Eames-designed deck of cards and marvel at photos of the groundbreaking Eames House, Case Study House #8 in the Pacific Palisades, which was hand-constructed in days of pre-fabricated steel parts intended for industrial construction. 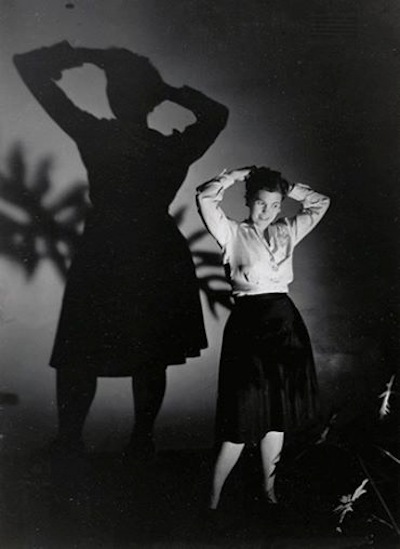 RAY EAMES: IN THE SPOTLIGHT — Opening reception Fri, Feb 28, 7 – 10pm; exhibition through May 4. FREE — Alyce de Roulet Williamson Gallery, Art Center College of Design, Hillside Campus, 1700 Lida St, Pasadena 91103. More info HERE. Yes, the Academy Awards are upon us (keep an eye on The Go Go for Oscar-viewing hot spots!) but the news of Perla Batalla in Concert is certain to distract Grammy watchers from the upcoming red carpet. The Grammy-nominated vocalist-composer will be performing songs from her award-winning Mestiza (“mixed blood”); co-written with David Batteau, the song cycle offers a vision of a vibrant culture still nourished and inhabited by mysticism, imagery, magic, and myth. Ms. Go Go is dreamy-eyed just thinking about it. Native Angeleno Batalla gained international acclaim as a back-up singer for Leonard Cohen who subsequently encouraged the vocalist to go out on her own; Saturday’s repertoire will include selections from the singer’s Grammy-nominated Leonard Cohen tribute album Bird on a Wire. In addition to favorites, Batalla fans can look forward to new collaborative compositions and work-in-progress from Blue House, Batalla’s upcoming one-woman show inspired by the work and words of Diego Rivera and Frida Kahlo. Blue House grew from a composition commissioned by LACMA to celebrate the opening of In Wonderland: The Adventures of Women Surrealists in Mexico and the U.S. The evening features pianist Karen Hammach; Batalla will also be joined her brother, comedy actor/writer Rick Batalla (founder of the Troubadour Theater Company). Go Go’ers, the red carpet leads here. 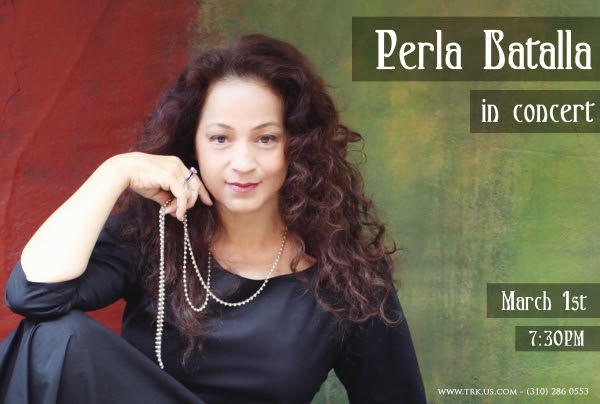 PERLA BATALLA IN CONCERT — Sat, March 1 @ 7:30 pm. $25 – $35 — Theatre Raymond Kabbaz at Le Lycee Francais de Los Angeles, 10361 W Pico, LA 90064 Get tix HERE.